Place the sliced apples in a 11x17 or 9x9 inch pan. Mix the white sugar, 1/2 tablespoon flour, nutmeg, and ground cinnamon together, and sprinkle over apples. Combine the oats, 1 cup of flour, brown sugar, baking powder, baking soda and melted butter together. Crumble evenly over the apple mixture. Bake at 350°F for about 30 minutes or until crumble is a golden brown. Don't have the time to peel your own apples? Just use 2 (21 ounce) cans of apple filling and add the cinnamon and nutmeg to it. Top with the crumble as usual. We are all creatures of habit and tend to gravitate towards the same types of food when we go out to dinner. For instance, every time I order dessert at a restaurant, I always go for something chocolate. 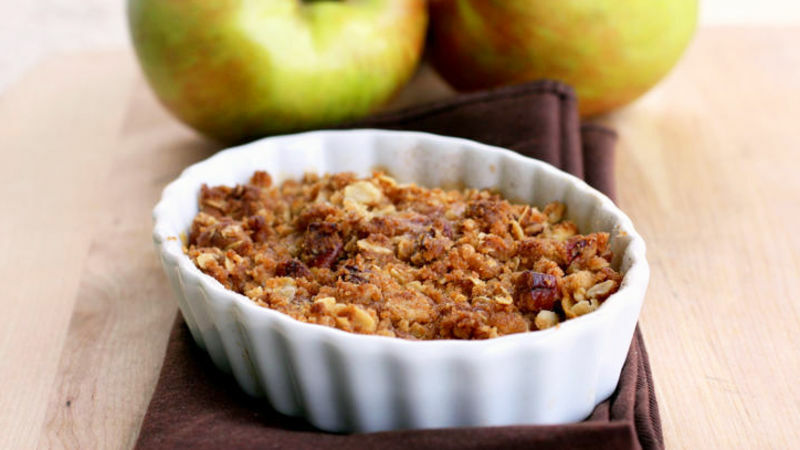 My husband, on the other hand, is constantly on a search for the perfect apple crisp. He orders it at every restaurant and is always disappointed. Not enough crumble on top, too dry, apples are too mushy...you get the drift. This apple crisp, however, he loved. I have always thought it's bold to label a dish as "the best" or "perfect" because you set some really high expectations but I have no qualms about calling this the Perfect Apple Crisp because it was just that good. Just slice up some apples. You don’t want them too thick so they cook fast, but you also don’t want them too thin so that they are mushy. Sprinkle on some cinnamon and sugar goodness. Top with a generous helping of oats, brown sugar, and pecans. Enjoy with a big scoop of vanilla ice cream. Time Saving Tip: Don't have the time to peel your own apples? Just use 2 (21 ounce) cans of apple filling and add the cinnamon and nutmeg listed in the recipe.